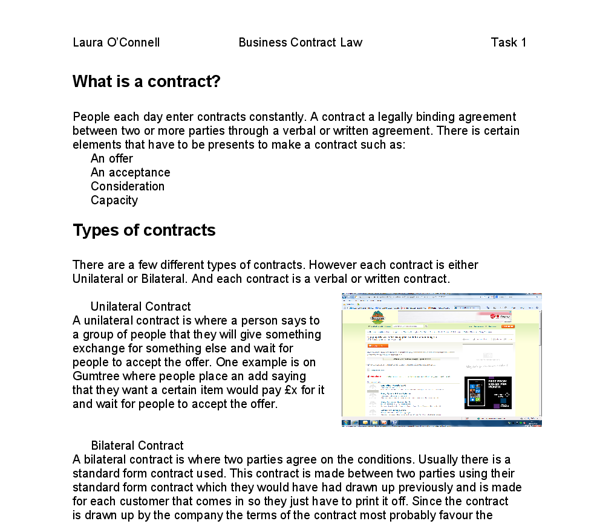 ï»¿Laura O’Connell Business Contract Law Task 1 What is a contract? People each day enter contracts constantly. A contract a legally binding agreement between two or more parties through a verbal or written agreement. There is certain elements that have to be presents to make a contract such as: An offer An acceptance Consideration Capacity Types of contracts There are a few different types of contracts. However each contract is either Unilateral or Bilateral. And each contract is a verbal or written contract. Unilateral Contract A unilateral contract is where a person says to a group of people that they will give something exchange for something else and wait for people to accept the offer. One example is on Gumtree where people place an add saying that they want a certain item would pay £x for it and wait for people to accept the offer. Bilateral Contract A bilateral contract is where two parties agree on the conditions. Usually there is a standard form contract used. 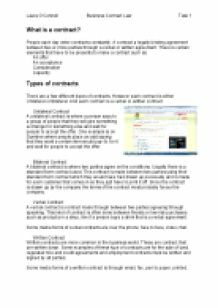 This contract is made between two parties using their standard form contract which they would have had drawn up previously and is made for each customer that comes in so they just have to print it off. ...read more. When a company or individual advertise goods or land or services for sale and are not treated by the courts as indicating the intention make an offer. These advertisements invite possible customers to make an offer which then can be accepted or not. If there?s no acceptance there?s no contract as acceptance is one the key features of a contract. Offer and Counter Offer After a person sees a product and gives in to invitation to treat they make an offer to the person or business selling the product. This is them showing willingness to make a contract with that person once accepted. They can offer the amount that was displayed or try a different deal. The person selling the product can decline the offer so it is then as if the offer never existed however they can make an offer back if they really want to sell the item. This is then called a counter offer. For an offer to be valid three essential things have to be present. These are: Clearly stated terms intention to do business Communication of that intention Offeror and Offeree An offeror makes the offer to the individual advertising a good or service. ...read more. Third is that an offer is made and the offeree rejects, the offer is gone and there is no contract. Scenario Shop has a sale sign up for 50% off I take a nosey and see a piece of clothing I like in the sale I go to the cash register to pay The cashier scans the product and tells me how much it is I then hand over the correct amount and the cashier gives me a receipt In the scenario the shops sign for 50% off items of clothing is an invitation to treat. When I go in and see an item of clothing marked at a certain price this still invitation to treat. When I go to the cash register to pay I am then making an offer and I am then the offeror. When the cashier scans the product and tells me how much it is and I hand over the money that person then is offeree and can reject my offer or accept. Once the cashier accepts my money and gives me back the receipt that is them accepting and a contract is made and done. ...read more. It did not introduce the monthly subscription concept until l?te 1999. Since then it h?s built its reput?tion on its policies of h?ving no due d?tes, l?te fees, or per-title rent?l fees. Netflix w?s born ?s ? result of ? Where as an old customer would already know all these things therefore will only expect a service of good and friendly quality. Customer service is what a business provides. It is so important, this is because customer service can either make or break a business. Anteriormente, la decisi�n de compra de productos cosm�ticos estaba centrada en las mujeres. Sin embargo esta din�mica ha dado un giro, la creciente demanda del g�nero masculino hacia productos que antes se consideraban de uso exclusivamente femenino han hecho que la industria se preocupe por desarrollar l�neas de productos espec�ficas para este segmento. are unconcerned with price and more focused on the quality of their flights so moving to a country with a slow economy such as Pakistan would be a disaster because simply the majority of people would not be able to afford to use the service. Acceptance through post is an exception to the rule which states that acceptance has to be communicated with the person making the offer. When the acceptance is posted, it?s considered to be immediately effective only if it is correctly addressed, stamped, and posted in the letterbox.